Crab meat = delicious! There is nothing more delicious than fresh crab meat. And if you have been fortunate to have crab, you also know how rewarding it can be to obtain their decadent meat after fighting with their cretaceous shells. If you don’t have the luxury of buying fresh crab, however, then the next best thing is canned crab. Canned crab is a great alternative to the fresh variety, when crab is not the main ingredient. Canned crab can be a little easier on the pocketbook than fresh and when shopping, be sure to look for sustainable options in the grocery stores. If you are shopping locally, then Dungeness crab is your best choice option. Refer to the SeaChoice Guide to learn more about how other crabs rate. 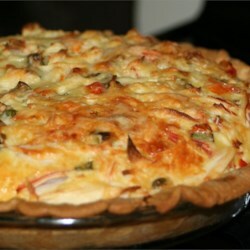 Here is a crab quiche recipe from allrecipes.com Canada.